I love this town. We only visited because I had an interview---to write articles on all that is available to tourists in Tuscany. It looks promising; sign me up to research on the art, history, food and culture of Tuscany. Castellina in Chianti is a small, quaint hilltop town south of Florence by about an hour. We rented a car and drove to my meeting, then drove home along the olive tree, vineyard heavy roads back to Florence. So many signs for vineyards, castles and frantoio were along this route---it was surreal. In Castellina (next time, I plan to spend more time in the city itself), we enjoyed coffee at a little cafe, found my new favorite ceramic shop and visited two 'wineries.' Actually, we visited one in-town factory for producing wine that had a haphazard store in front. You could tell they were thick into producing and shipping wines, and while they had an official storefront---it was clearly an afterthought. Still, we browsed and tasted. Ambiance easily tossed aside, we weren't floored by the wines. We walked away with one bottle and a map of Chianti. Not but a stone's throw from there, we went into a wine shop---full of good wines and deliberate in display. We tasted wines, chatted with the owner of the store (who is also the owner of the vineyard not 2k away), and made plans to visit the vineyard Poggio Amorelli. She opened up bottles for us (her only customers), and sliced wedges of cheese out of a new round. Again, [this time, great] ambiance aside... we actually were very impressed with the wine. We wanted to splurge on her best vino, but instead went the middle route: this wine was worth every euro and then some. 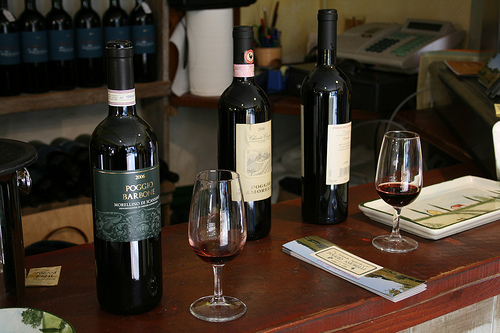 Buying direct is good: you get better deals than buying bottles from wine shops in Florence. Finally, we struck out along the road north, and stopped at another 2 wineries and a frantoio (olive oil estate). Someone had recommended we stop at Fontodi; we tasted a flight of chianti's, 'Super Tuscans' and a single, memorable syrah. Coming from Washington state---where we are known for our syrahs---we were skeptical. But their syrah, in the end, was the best wine we tasted that day. For them an experiment; for us, a delight. It cost about 40 euros a bottle. We didn't buy any, but went away with a large bottle of their Chianti---safely tucked away in its box until Christmas. We also stopped by Panzanello. While impressive in stature, the ambiance did nothing for us. It was a winery all about volume, large tour buses and huge sales. We are the little guy, and felt as much. I wished we loved the wine, but we didn't. Still we were cordial, bought a bottle, and disembarked. We learned: we liked the little wineries, and the stories behind the estates. Big tasting rooms are not prerequisite for good wine. For every winery you adore, you will visit 3-4 that don't float your boat (maybe more). Finding the gems is rewarding; tastings anywhere, are educational. It is a win-win. Apr 29 Chianti tasting... with Caleb. Jul 13 Vinci Italy: Day 3.